The beginning of a new school term is almost upon us andso too is a new term for Erebus Motorsport V8 (EMV8) with the Symmons Plainsand Pukekohe events representing the second phase of the team’s ambitiousproject – engine and chassis development. EMV8 chief executive officer Ryan Maddison says the taskof getting three Mercedes-Benz V8 Supercars on the grid has been well documentedand discussed, and now the team moves to focus on vehicle competitiveness. “We have completed the first quarter of the year and haveour first two race events behind us, so we now move into the second phase ofour project,” Maddison said. “In the lead up to Symmons Plains a small team of Erebusengineers travelled to Affalterbach in Germany where we worked alongside theteam there to map out a plan moving forward in 2013, which encompasses short,medium and long term goals. “We see short-term improvements with the current packagebeing optimised for Symmons Plains and Pukekohe. “Perth will represent the point when we expect to observenotable improvements in the cars’ performance and by the time we enter theendurance race season we should be heading into the phase for our long termgoals. It is literally akin to foundations and building blocks. “I am confident that we have the right criteria of teampersonnel and drivers to make this project successful even with the shortschedules we have had to manage through. 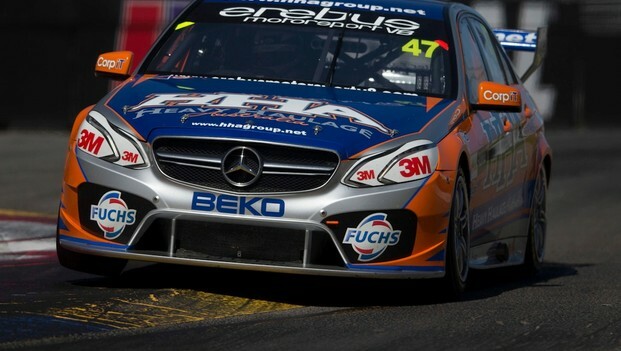 The Mercedes-Benz E63AMG V8 Supercars will be on track today at the Tasmania Microsoft Office 360 atSymmons Plains.